Sony propose depuis le 27 novembre 2018, le film Philadelphia 25th Anniversary (Philadelphie en format 4K Ultra HD, réalisé par Jonathan Demme et mettant en vedette Tom Hanks, Denzel Washington, Anna Deavere Smith, Joanne Woodward, Jason Robards, Antonio Banderas et Bradley Whitford. Des pistes sonores anglaise et française sont disponibles. Andrew Beckett, brillant avocat, est appelé à une carrière fulgurante. Adulé par son milieu, rien ne semble pouvoir ralentir son ascension. Mais, le jour où ses associés apprennent qu’Andrew est atteint du sida, ils n’hésitent pas à prétexter une faute professionnelle pour justifier son renvoi. Andrew décide de ne pas se laisser faire et attaque le cabinet pour licenciement abusif. TORONTO, Ontario (November 27, 2018) – One of the first studio films to bring light to the HIV/AIDS epidemic, Sony Pictures Home Entertainment Canada commemorates the 25th anniversary of this important and enthralling modern classic with the debut of PHILADELPHIA: 25th ANNIVERSARY on 4K Ultra HD™ and on digital in 4K with HDR November 27. Tom Hanks, in his first Academy Award® winning performance, plays Andrew Beckett, a talented lawyer with HIV fired because of his condition. Two-time Academy Award winner Denzel Washington (1989, Best Supporting Actor, Glory; 2001, Best Actor, Training Day) is the small-time lawyer who teams up with Andrew as the only willing advocate for a wrongful dismissal suit. In addition to Hanks’ win as Best Actor, PHILADELPHIA was nominated for a total of five Academy Awards, with Bruce Springsteen winning Best Music, Original Song for “Streets of Philadelphia.” PHILADELPHIA also stars two-time Academy Award winner Jason Robards (1976, Best Supporting Actor, All the President’s Men; 1977, Best Supporting Actor, Julia), Academy Award winner Mary Steenburgen (1980, Best Supporting Actress, Melvin and Howard), Antonio Banderas (Frida) and Academy Award winner Joanne Woodward (1957, Best Actress, The Three Faces of Eve). 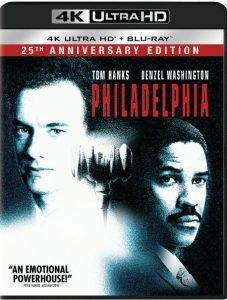 Fully restored in 4K from the original camera negative, PHILADELPHIA: 25th ANNIVERSARY on 4K Ultra HD features High Dynamic Range and exclusive Dolby Atmos audio. The 4K Ultra HD package will also include the film on Blu-ray, stemming from the 4K master. The Blu-ray will not be available separately. 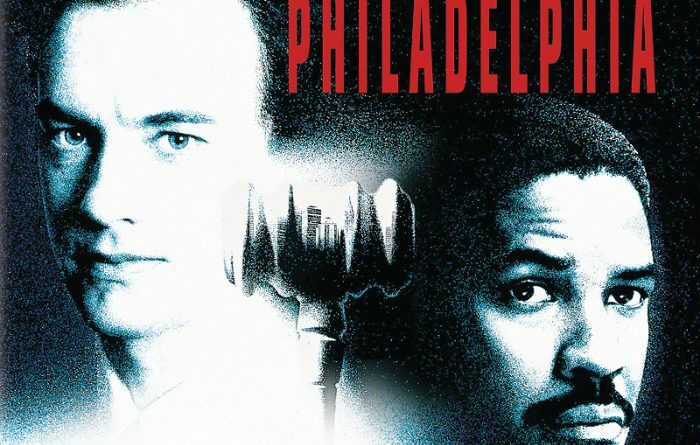 Hailed as a landmark film that dazzles with deep emotion and exceptional acting, PHILADELPHIA stars Academy Award® winners Tom Hanks (Best Actor, 1993,Philadelphia; 1994, Forrest Gump) and Denzel Washington (Best Actor, 2001, Training Day) as two competing lawyers who join forces to sue a prestigious law firm for AIDS discrimination. As their unlikely friendship develops, their courage overcomes the prejudice and corruption of their powerful adversaries. Jonathan Demme; with Gary Goetzman, Kenneth Utt and Ron Bozman serving as Executive Producers. PHILADELPHIA has a run time of approximately 125 minutes and is rated PG.